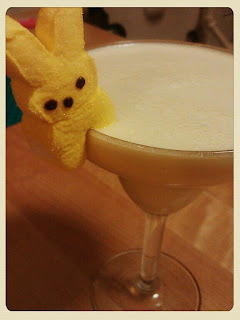 I'm Not Skinny: The Peeptini, cocktail of my dreams. The Peeptini, cocktail of my dreams. This frothy delicious peeptail became my Easter dessert. Magically delicious! 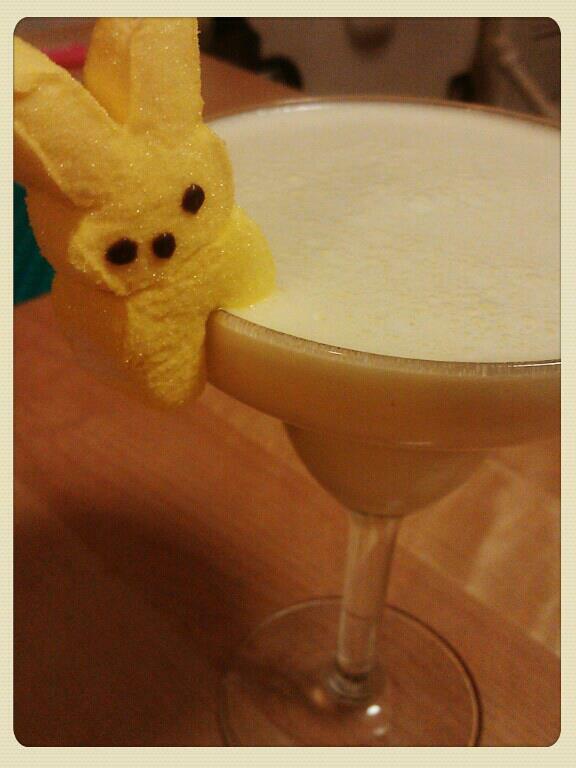 4 peeps (for cup garnish). Take the first 4 ingredients, chuck them in a blender and hit 'liquify'. This may take some time, you want to be sure there are not chunks of marshmallow. Once the consistency is creamy and getting a bit frothy add about 4 ice cubes and blend again. Then serve! I used margarita glasses and then garnished each glass with a little peep. If you're not happy with the color, feel free to add a drop or two of food dye. TADA! Now you know exactly what to do with those left over Easter Peeps. Hum--you have LEFTOVER PEEPS--not in this house!! I gobble them down faster then you can snap your fingers!! I love the HEALTHY shot part of the recipe. peeps, it is! Cheers!! I saw this and thought oh my goodness I must try it! I wonder if I can find any Peeps left in the store. I am going to search for them. Anything with the Whipped Vodka has to be good! I actually just bought a bunch at 50% off yesterday at CVS! I am not a martini kind of gal but I find this very cute! This sounds yummy! I will have to try this out the next time I see peeps in the stores! I have a ton of peeps unfortunately I am a light weight so might need less vodka, lol. Sounds delicious though. The Peep gives it a whimsical presentation. The question is… do you like your Peeps fresh out of the box or do you let them get just a little bit stale overnight? Here's my secret: I purchase peeps in the days following the holiday and then I store them in a ziplock baggie, still in the original sealed package until the following year. :D They get the crusty outside maintain the squishy inside and are amazing.